Every lean practitioner occasionally wishes for a simple, fun, and quick-read introduction to lean thinking to give acquaintances, associates, and family members – even to our kids. If lean thinking often entails unlearning a plethora of bad habits, wouldn’t it better if we learned better thinking – and habits – from the beginning? Everything I Know About Lean I Learned in First Grade is just that sort of book. 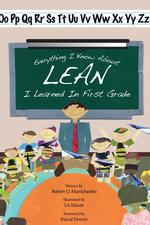 It brings lean back to its original simplicity by showing how lean is alive in a first grade classroom. The book connects common lean tools to the broader lean journey, shows how to identify and eliminate waste, and aids the reader in seeing lean for what it truly is: a way to create a learning and problem-solving culture. Written to educate the entire organization on the fundamentals of lean thinking, this is the perfect source to engage all team members at all levels of an organization. Originally self-published in 2008, LEI is proud to re-issue this book and make it available to the broader lean community.